In our earlier posts, we have discussed different delivery types like Delivery Weekday, Delivery date with Time Range and Delivery date with Time Slots from Order Delivery Pro for WooCommerce plugin. Generally, deliveries start from the same day in the calendar for all the delivery types from the plugin, but you can adjust your delivery days based on your store requirements using the settings. In this post, we will discuss how same day delivery works on the checkout page with different settings. Same day delivery means the day on which the customer places an order and want the delivery on that day itself. For example, I have a gift shop where I can deliver my products on the same day when the customers place an order. 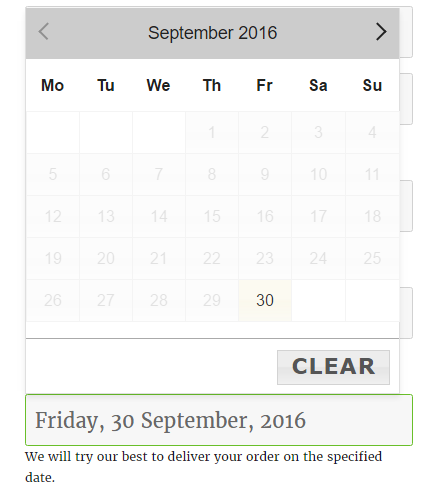 So you want that the today’s date should be available for delivery in the calendar and the customers can select the date. 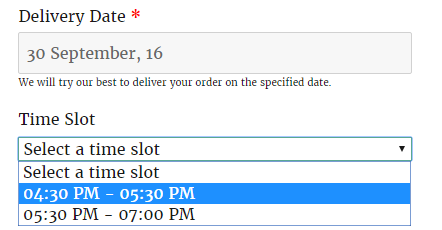 You can setup this under Order Delivery Date -> General Settings -> Time settings. To enable Same Day Delivery, you need to select the Enable Same day delivery checkbox. After enabling Same Day Delivery checkbox, you have to set Cut-Off Time for Same Day Delivery Order. Cut-off time is the time after which you do not wish to take any further orders for today’s date. For example, if you have a cake shop and you can deliver the cakes on the same day but only till 7.00 PM. So can set the cut-off as 19:00. If any customer visits your site after 7.00 PM then they will find today’s date unavailable for any further deliveries. The same day delivery cut-off will work on the WordPress timezone and not based on the customer’s local time zone. For example, the cut-off time is set to 7.00 PM in the above case, and if a customer visit to your website at 6.50 PM as per their local time zone, but as per your website’s WordPress time zone it is 7.00 PM already, which means cut-off time is over. So they will not be able to place the order for today’s date. After setting up the Same Day delivery cut-off for your website, when users will place an order, they will find today’s date on the delivery date calendar if they are coming before the cut-off time has passed. But, if users will try to place an order after the cut-off time is over, then the today’s date will not be available for deliveries and the date will be disabled in the calendar with a label mentioned as the Cut-off time over. The customers will then need to select the delivery date from next day onwards. In the above example, if a customer comes before the cut-off time has passed to purchase a product and select today’s date but for some reason if they do not place an order at the same time and comes again to the website after the cut-off time has reached and tries to place the order with today’s date selected. In this case, it will not allow customers to place an order as the cut-off time has reached. It will display a notice mentioning that the cut-off time for same day delivery has passed. For example, if a customer comes on your website at 6.50 PM and the cut-off time set is 7.00 PM. In this case, the customer adds the product to the cart, enter the billing and shipping details and select today’s date in the delivery calendar. This takes around a time of 8 to 10 minutes. Here when the customer places an order after 7.00 PM then it will display a notice that cut-off time for same day delivery is over and it will not allow you to place the order. Earlier we have discussed on how we can setup time slots along with weekdays and specific delivery dates. You can learn more about how to create time slots from this post. 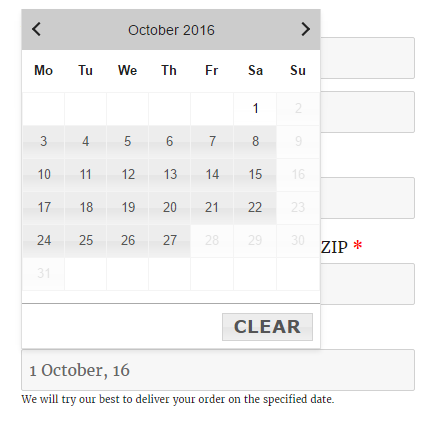 For same day delivery, the past time slots as per the WordPress timezone will not be displayed in the dropdown if the today’s date is selected on the checkout page. For example, I have cake shop and I deliver my cakes for four time Slots. Time slots are 9.30 AM to 10.30 AM, 11.30 AM to 12.30 PM, 1.30 PM to 3.30 PM, 4.30 PM to 5.30 PM and 5.30 PM to 7.00 PM. So if a user visits the website at 3.45 PM as WordPress timezone. Then the time slots after 3.45 PM will not be available for delivery. The first available time slot in the dropdown is 4.30 PM to 5.30 PM on the checkout page. Note: Minimum Delivery Time does not work when Same day delivery is enabled. The configuration setup in Same day delivery will take precedence & the hours entered in Minimum Delivery Time field will not be considered in such cases. In the above examples, we saw how you can setup same day delivery in different ways. This feature is useful for such business where you deliver your product on the same day like cake shop, grocery shop, flower shop but for a limited period of time. And also it is useful if you want that the cut-off time should work based on your store’s timezone and not customer’s local time zone. You can setup other settings like Additional Charges for same day delivery. We will be discussing them in our future posts.